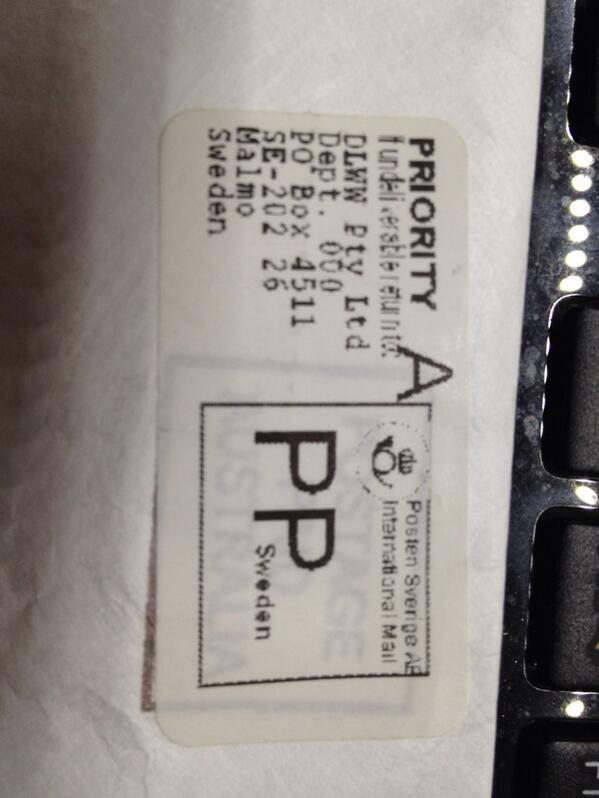 Hmm, this viewer in Singapore got his rulers via Sweden! I'm getting the feeling that my mailing house sent them all to another mailing house in Sweden! That would explain why Sweden got them first (and no one else yet), and also the delay. Mine has arrived, although it may have arrived earlier as I didn't check the mail box yesterday. Just out of curiosity Dave, is it possible to post a by country count of people who ordered? I'm intrigued with how popular this site is within the Asian regions. Wouldn't surprise me, sending one package to Sweden to be broken up across the Euro-Region would be cheaper then individual postage costs. Dave browsed quickly through addresses in one of the videos, all he showed was countries and cities/regions. I will probably have only µRulers in this city when they arrive. I hope next project will ship from singapore or hongkong with tracking number since it doesn't cost almost anything extra at all. I would happily pay 1$-2$ extra for ability to track things. Sure, but last I checked Singapore isn't in Europe! Still no reports of any other country receiving them. I think they ripped you off... or did you provide your blessing? 'Ladyada' has just offered one in black. No rulers in manchester uk and i have things to measure! Any longer we have to send him a mail bag. "Ahh it's count down timer, no! its and IE..........................."
Yeah, odd that Sweden have them, and us in NZ, right next door are still waiting on ours... Never mind; they'll turn up eventually. Totally different design, nothing to do with me. I don't own the concept of a PCB ruler. Given that they were supposedly shipped 16 days ago, the only explanation is that they were all shipped to another mailing house in sweden. I'm pretty certain they at least printed the envelopes in oz!, and most likely stuffed them too, but I'm getting the vibe that the actual mailing was not done by regular Aust post. Heck, if I pop them in the local post box, they get delivered overseas in only a few days, maybe a week tops for some countries. If a large part of the recipients are in Europe, it may very well be cheaper to pay low rates within Europe and pay extra for the lower number of NZ/Asian recipients. I wouldn't expect postage from SE to America to be particularly cheap, though. If they outsourced this to a company doing a lot of international mail, then they may very well have negotiated a low bulk rate with postal services in whatever country offers the lowest rate. Sending mail at the lowest possible rate can lead to some interesting mail routing. Yes, perhaps. There could be separate mailing houses for the US/Canada and other regions as well. But still, 16 days is getting beyond acceptable. I could have spent 5 days packing them myself, and then 5 days via Australia Post and almost everyone worldwide would have had them by now. I paid $2.28 in bulk postage for each one compared to OzPost's single standard international rate of $2.60. Still, I was under the impression that they would all be lodged with Australia Post. I would have happily paid the $2.60 if it didn't mean this delay. I'm not very happy about this whole thing. Probably time to check your contract with that mailing house. I did find this mention of DLWW, from this and another link (with NSFW spam links) they are a drop shipping company sometimes used by dodgy organisations. It seems like a good company to use if you want your mail delivered slowly, on purpose, otherwise not worth the trouble. I am Singapore too, but no ruler in my post box. Incidentally, I have ordered some Adafruit rulers which only became in-stock just recently, and they may arrive earlier than uRuler. Yaroslav @drug123 twittered me that Sweden post operates in Singapore. That explains why I receive uRuler just after Sweden. There's your mistake. You should have got several teams of lawyers in on both sides. You probably could have posted them in 2015 at a cost of $274000.